Belgrade is getting a facelift. Finally. After not years, not decades, but centuries of turmoil, the capital of Serbia is at peace. War-torn buildings are being replaced, restaurants and clothing boutiques are opening daily, and, most tellingly, tourists are pouring in. The White City–situated at the meeting point of the Sava and the Danube rivers–is one of the oldest cities in Europe. As well as one of the most fought over. One hundred and fifteen–yes, you read correctly–wars have been fought here. The city has been destroyed 44 times. So there was a lot of work to be done. Security was the first priority. Then the international hotel chains started staking their claims. Now boutique hotels, like Square Nine, are starting to appear. Square Nine overlooks Studentski Trg, the oldest square in Belgrade. Heated floors, cashmere throws, and framed postcards of the city make the minimal rooms feel cozy. Have a quiet breakfast in the interior courtyard. Ease your jet lag at the subterranean spa, which has a Japanese ofuro tub, a steam room, and a lap pool. Craving a strong drink? Go to Ebisu, a Japanese restaurant on the rooftop, for a sake cocktail. The hotel has an ideal location, halfway between Republic Square and the Belgrade Fortress. Republic Square is surrounded by the National Theatre, the National Museum, and a statue of Prince Michael, whose second reign ended with his assassination. Choomich, the emerging Belgrade Design District, is nearby. From the square, follow Knez Mihailova, a pedestrian-only street. 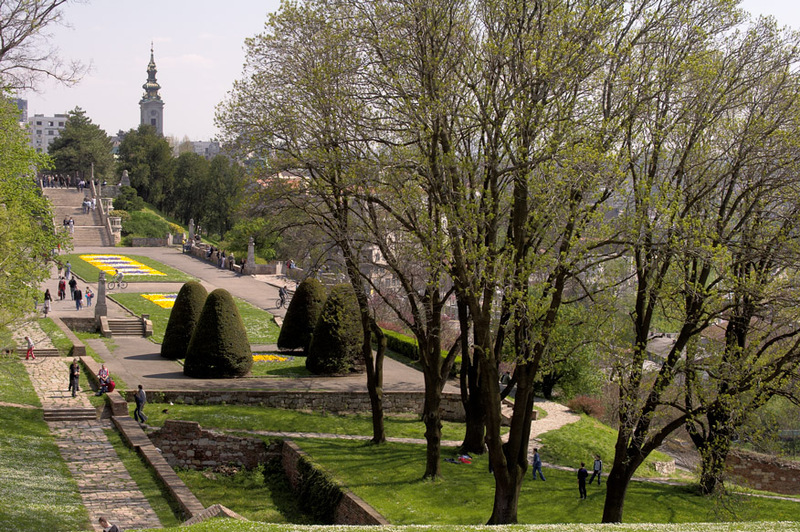 You’ll see old mansions, international clothing stores, and busy cafés as you walk toward the Belgrade Fortress. The riverside fortress, a former military fortification, is now surrounded by the city’s largest green space, Kalemegdan Park. Old warehouses are being turned into new restaurants–some with great river views–near the park. Try a Serbian Chardonnay from Krnjevo at Public Dine & Wine, a restaurant that is modernizing traditional Serbian meats. Or wrap a scarf around your neck and sit on the deck at nearby Comunale Caffè with shrimp risotto and lemon crème brûlée to watch the sun set. Not too long ago, this trip wouldn’t have been possible. But with Belgrade’s ongoing renovation, people are enjoying the city now more than ever. Let’s hope this new trend continues for many centuries to come.